Deployments aren’t exactly known for being comfortable and fun. However, you can make time away a little less painful by sending your loved on with some of these creature comforts. Note: As much as I love a good surprise, I strongly suggest that you talk to your service member before buying any of these items. They probably have a much better idea of what sort of items will suit their particular voyage. There’s a huge difference between being on a sub vs. living in your truck vs. sharing a former shipping container with a couple of your closest friends. There are also wide varieties in what sort of items will be available at the deployment location. Noise-cancelling headphones are great for shared spaces, and wireless options are more affordable than ever. Durable earbuds even come in noise-cancelling options! Your base exchange probably has a good selection for better-than-average prices. Everyone loves a good tablet, but adding a keyboard pushes the tablet into a whole new dimension. In many cases, you can skip the laptop altogether. Your two basic options are the Kindle Fire and the Apple iPad. Both are available in a variety of screen sizes and memory capacities. I think my husband was skeptical when I bought him a keyboard for his Kindle, but he has repeatedly said how much he likes it, and I see him using it all the time. Especially on deployments where space is an issue, a tablet with a keyboard is a great alternative to a laptop. A reliable flashlight is a deployment necessity. Different deployments have different needs, so ask before you buy. Considerations include whether they can recharge batteries, how strong it needs to be or if it needs to have low settings, and whether there is a need for different color lens. Don’t forget that mailing batteries overseas is a problem, so send lots of spares if recharging isn’t an option. Owned and operated by a Navy spouse, Navy Rack Packs offers custom rack curtains with integral storage, specially designed for nearly every berthing situation. Contact them to figure out the right curtain for your sailor, and tell them that Kate sent you! because I thought it was just free shipping. I was so wrong! In addition to free books and free music, Amazon Prime video offers thousands of free movies and television shows. If your deployed service member will have access to wifi, a subscription to Amazon Prime is a great value. subscription. Start off with a 30 day free trial, then it is just $9.99 per month for unlimited reading on a large portion of the available Kindle books and audiobooks. Not every title is included, but it can still be a great value. And you don’t have to have a Kindle device to read and listen to Kindle books – it works on phones, iPods, and laptops, too. Regardless of where you buy them, nice sheets can make deployment a lot more comfortable. A tan or sandy color hides a multitude of sins and won’t show fading and discoloration from washing in weird situations. I’ve sent this memory foam mattress topper on every deployment. My husband cuts it down to fit his bed, and leaves it for the next person when he comes home. This comes packaged tightly, but they wouldn’t ship to APO/FPO addresses last time I checked. Instead, I had it sent to my house and just sent it on without unpacking. Once the topper is out of the packaging, you’ll never get it that small again! Overstock.com also offers free Club O membership for military members, and one of the benefits is free shipping. Love that! I’m sure other memory foam mattress toppers would work equally well, but I wanted to share this one that has worked well for us. We’ve had the one on our bed for YEARS and it is just starting to need to be replaced. If your service member will be sharing a shower, solid shower shoes and a comfortable way to carry toiletries can make life a lot easier. I like this toiletry bag from LL Bean: it hangs well in the open position and is available in a bunch of sizes. Microfiber towels take up less room and dry super-fast, plus they make a good light blanket in a pinch. Favorite toiletries might not be available, so stock up on essentials. Don’t forget that aerosol shaving cream can’t be mailed – lotion or solid options work well.. Other popular items include baby wipes, hand sanitizer, bug repellent, and Bio-Freeze or Tiger Balm to soothe tired muscles. 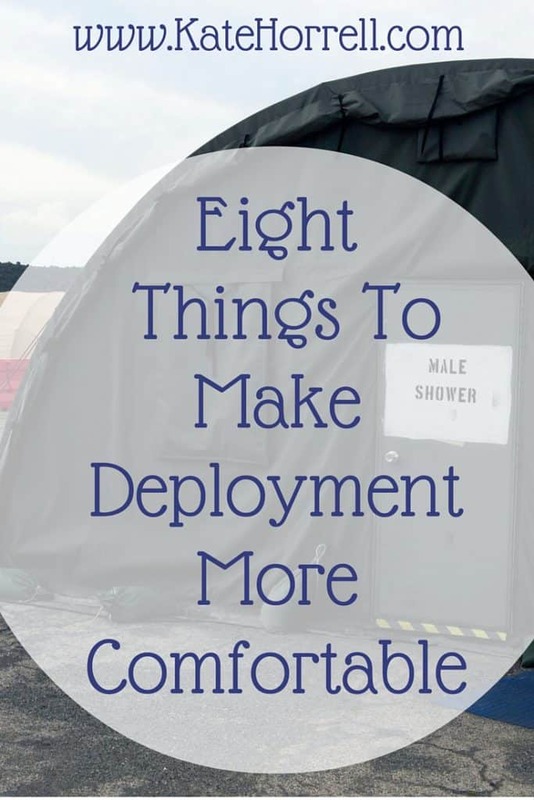 Obviously, there are a million things that could make a deployment more comfortable, and I’m sure you have great ideas I’ve never even considered. Please share your thoughts in the comments so we can all learn! THANK YOU for providing info on items that are “outside the box.” What family isn’t tired of sending the same ole same ole? One thing I might add to the list is a book light, with extra batteries included. May even want to order the extra batteries from the new Amazon account so your soldier knows exactly what to order when the last extra is used. That’s a great idea, Kim. Thanks for sharing it! Buying a memory foam mattress topper was the best deployment related idea I ever had! I now recommend them to everybody I know who goes out. It is seriously the difference between constant pain and suffering and a (basically) easy night of sleep. I’ll never deploy without one again. Awesome list Kate! Nice sheets and a foam mattress topper will be nice surprise for my husband when he deploys next!